Chapelle Notre-Dame de Bon Recontre. At Notre-Dame-de-l’Osier, a tiny chapel (Chapelle Notre-Dame de Bon Rencontre) is located in the vicinity of where miraculous events are believed to have occurred in the seventeenth century. 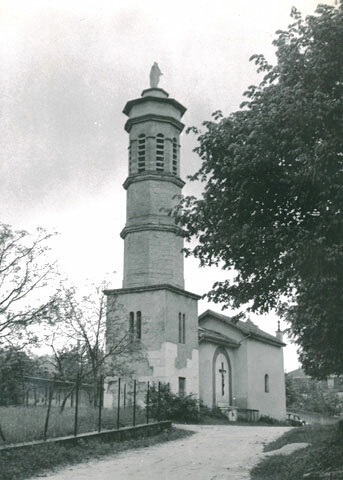 The tower attached to the chapel was first built in 1856 (and restored in 1941) to commemorate the proclamation of the Dogma of the Immaculate Conception. A new and larger church, now a minor basilica, was built in the centre of the village in the late nineteenth century to cope with increasing numbers of pilgrims. Notre-Dame-de-l’Osier, which means ‘Our Lady of the Willow’, was named after a vision that was claimed to have been experienced here by a local farmer. In March 1649, Pierre Port-Combet was defiling the Feast of the Annunciation by working to cut down a willow tree when what seemed to be blood began to pour from the wood. Eight years later, in March 1657, Port-Combet had a vision of the Virgin Mary in one of his fields. He claimed that she appeared to him, referring to his earlier experience with the willow tree, and urged him to change his ways. Port-Combet subsequently became a convert to Catholicism and the site of his ‘happy encounter’ or ‘good meeting’ with Our Lady was commemorated by the construction of the Chapelle Notre-Dame de Bon Rencontre. 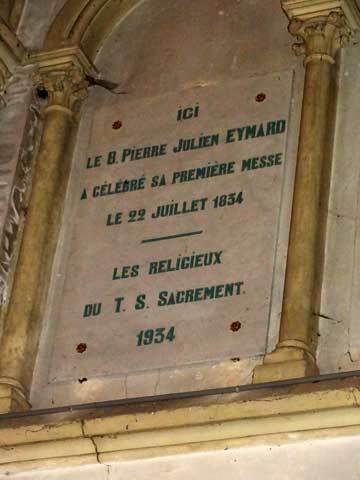 Plaque commemorating the centenary of Eymard’s first Mass. 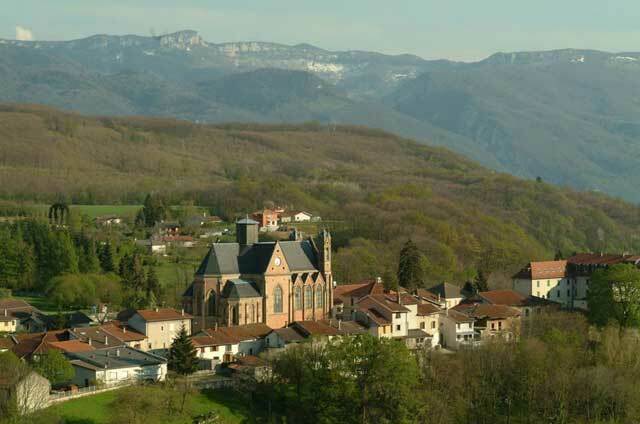 The locality assumed the name Notre-Dame-de-l’Osier and became a popular Marian shrine and place of pilgrimage in the late seventeenth and eighteenth centuries. It declined in the aftermath of the French Revolution, but was revitalised when St Eugene de Mazenod’s Missionary Oblates of Mary Immaculate were entrusted with the pastoral care of the local parish in 1834. Soon after the Oblates’ arrival, Peter Julian Eymard was ordained a priest of the Diocese of Grenoble on 20 July 1834. In the path to his priesthood, Eymard had enjoyed a close association with de Mazenod’s Oblates. This relationship may have influenced his decision to celebrate his first Mass alone in the Chapelle Notre-Dame de Bon Rencontre at Notre-Dame-de-l’Osier on 22 July 1834.